Jackie Fo: Blindfolded Dinner Experience! 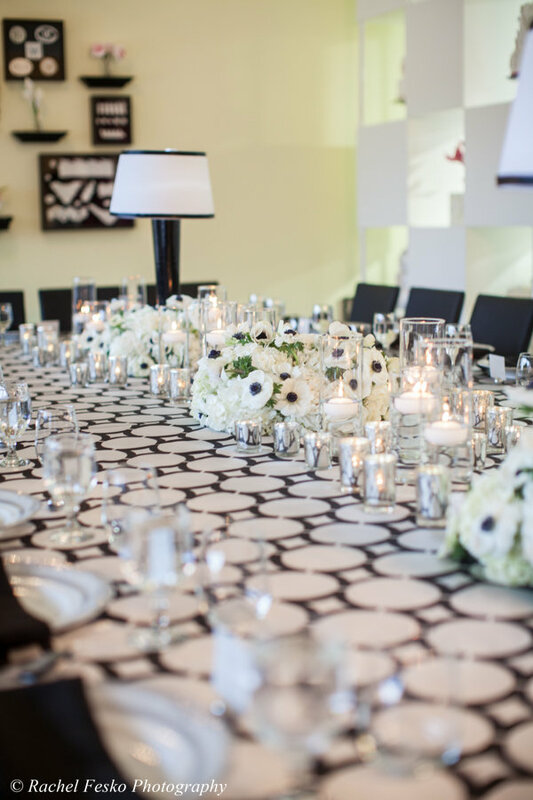 Amazing food, beautiful table decor, great conversation...all these things make for a great dinner party. Oh, I forgot blindfolds. Say whaaat? I'll explain. Well a few weeks ago I got this invitation in the mail, and I knew I was in for quite the dinner party. 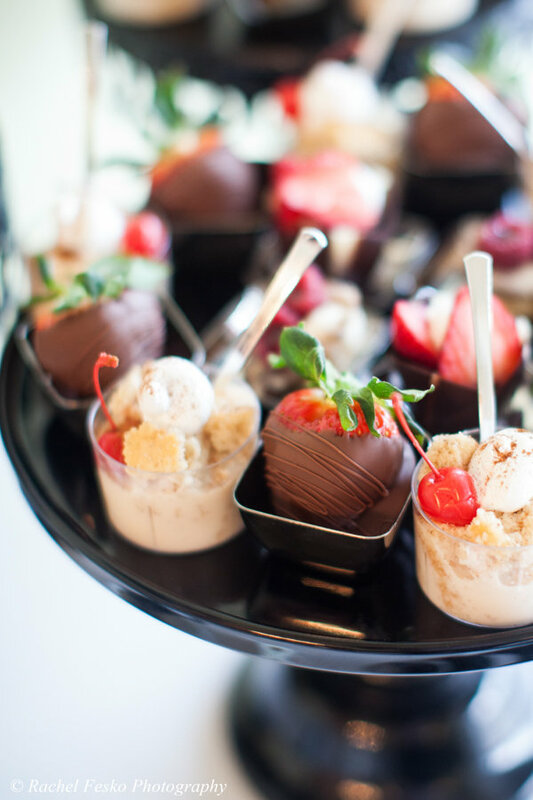 All Photos by Rachel Fesko Photography. Additional Vendor Credits at the end of the post. 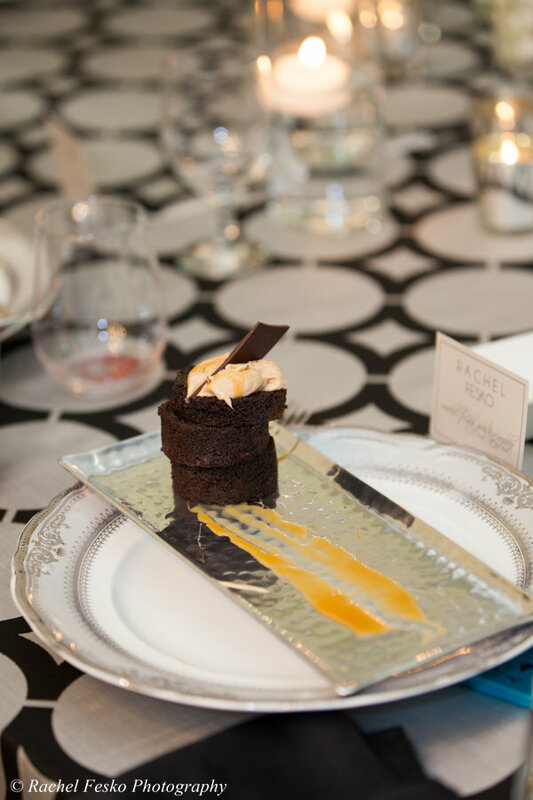 Wow Factor Cakes (who makes delicious and spectacular wedding/specialty cakes) hosted this gorgeous event with food and wine pairings from Passion8 Bistro. (Side note, the food was amazing and I'm headed there asap. 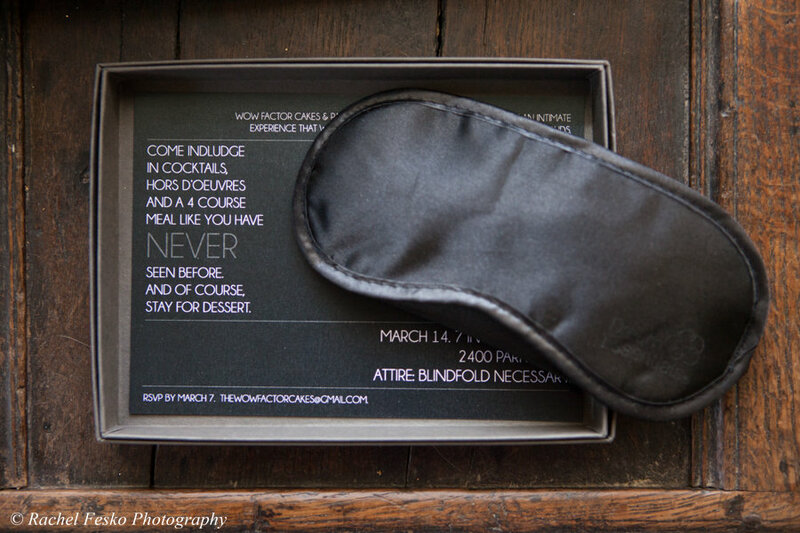 )When the blindfold came in the mail with instructions to bring it to the dinner party, I knew I was in for something seriously eye-opening. 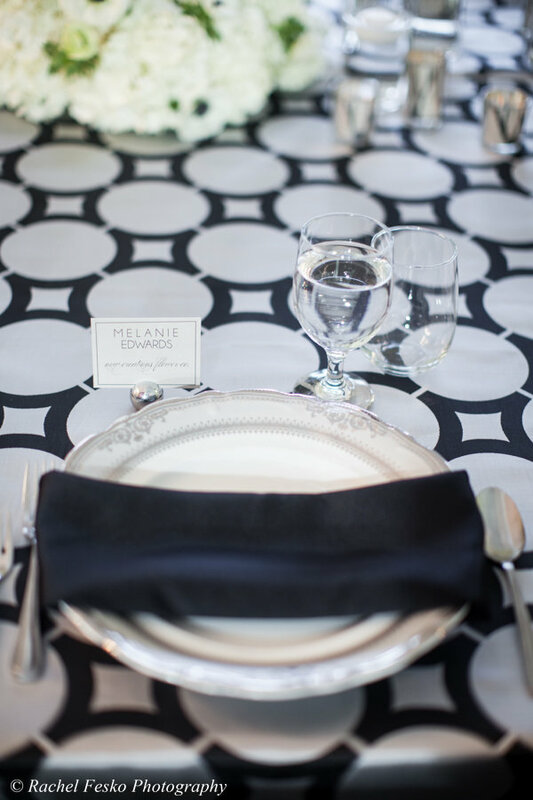 I loved the chic table decor and the black and white florals. 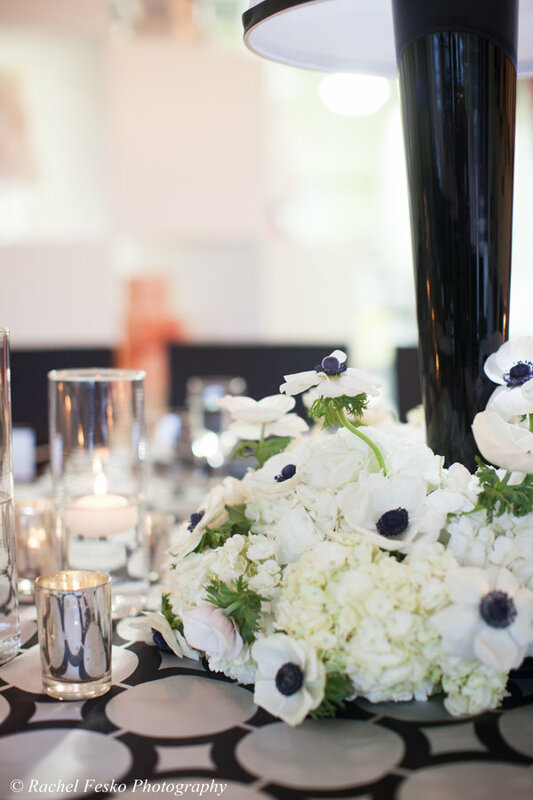 I'm looking into using the black and white anemones for a wedding I have coming up...they're so unusual and fun. 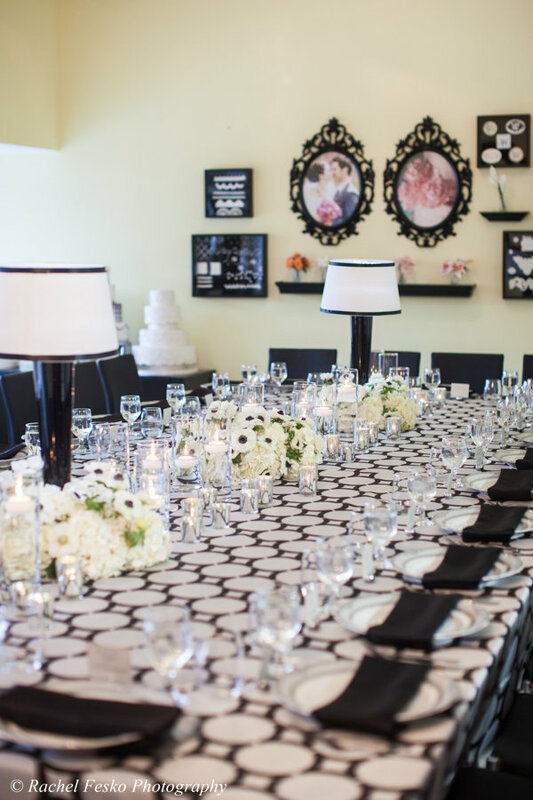 The table decor goes perfectly with Wow Factor's stylish studio, which has a beautiful chandelier, and photos and cake models of their beautiful work. Of course the main attraction was the food, although we couldn't see it. 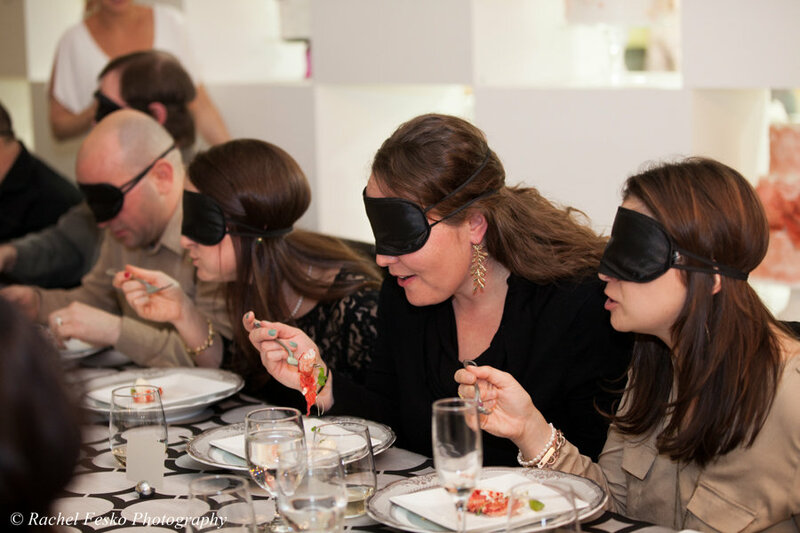 Yes, we were completely blindfolded for the four-course food and wine tasting! It would have been a shame to not see the beautiful food presentation, but luckily the chef explained each course to us (and showed us the presentation) after we ate! 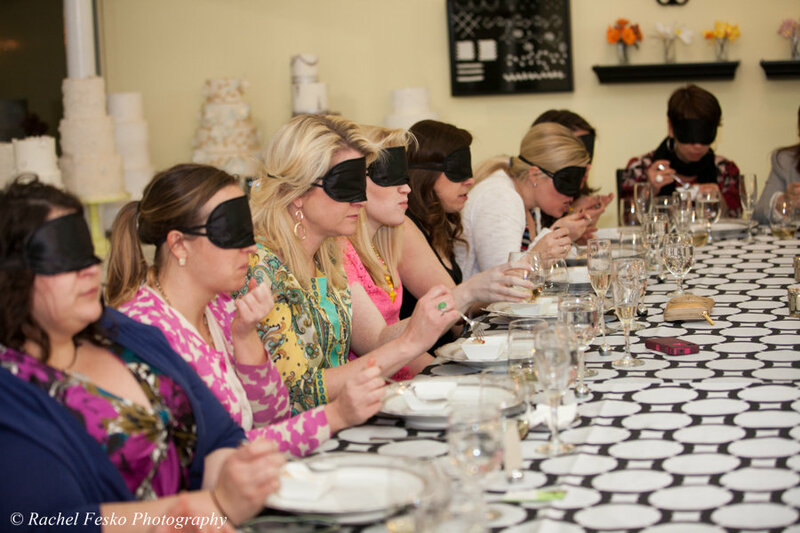 We had fun eating the courses blindfolded and trying to determine exactly what we were eating! 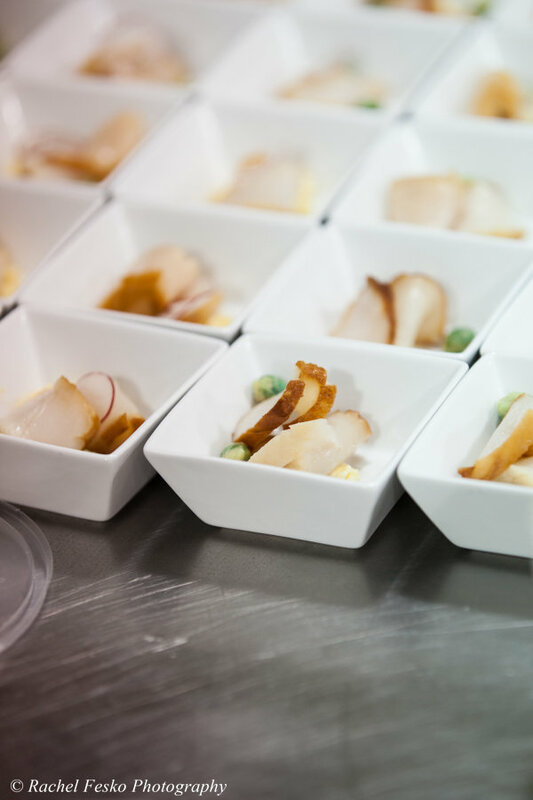 The first course was a delicious scallop with fabulous flavor accoutrement. It was definitely difficult to eat blindfolded, but it was also a fun element of surprise. 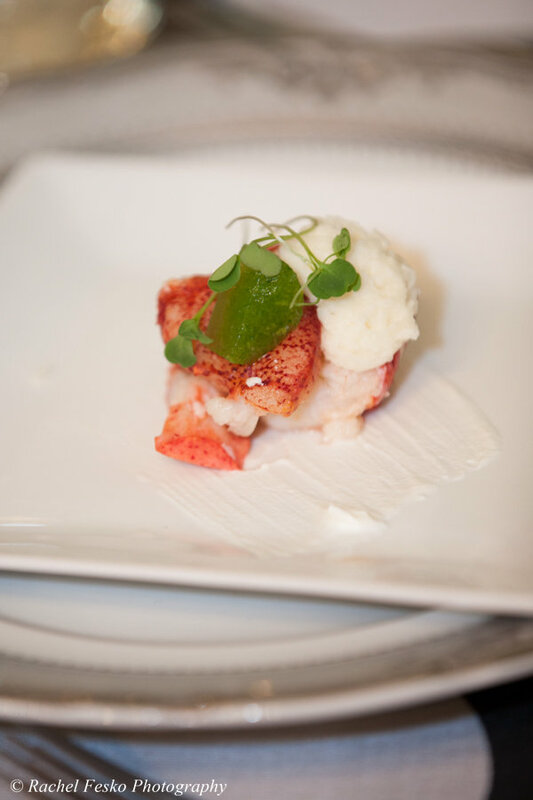 Lobster was also served for the occasion. If you're wondering, eating lobster blindfolded was not easy! 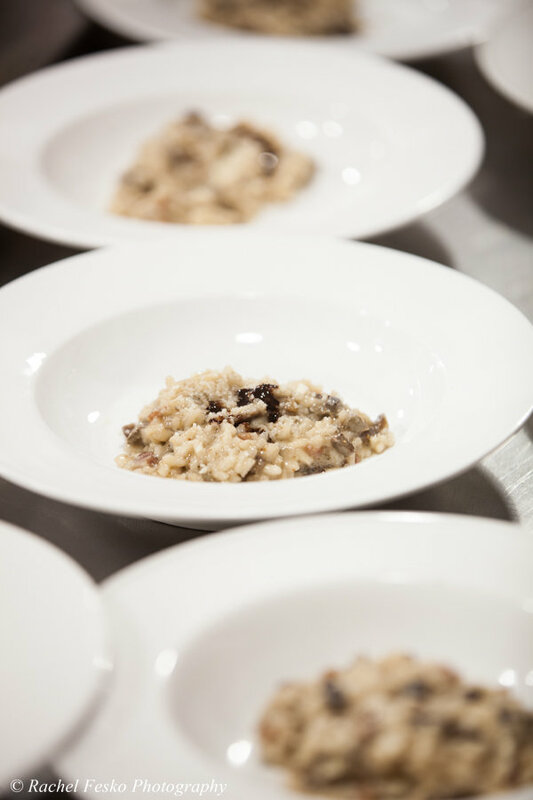 We were also served creamy risotto with liver. Yup, liver - it was surprisingly delicious! I was blindfolded so I didn't know what I was eating, but who knew - I'm a liver fan! All I remember about the dessert was how decadent it was and the fact it was served with a dessert beer - who knew they had dessert beer? 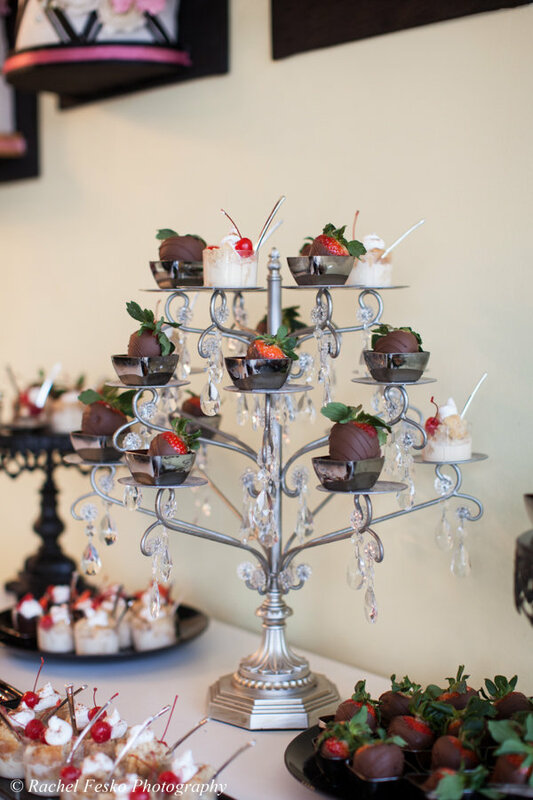 Neets Sweets created a beautiful dessert table with dessert favors for us all to take home. Full disclosure, despite eating my face off at dinner, I most definitely ate a few Neets Sweets in the car on the way home. They were just so pretty I wanted to see if they tasted as good as they looked! Btw - they did. Take a second and read about Neets Sweets mission which is so important. 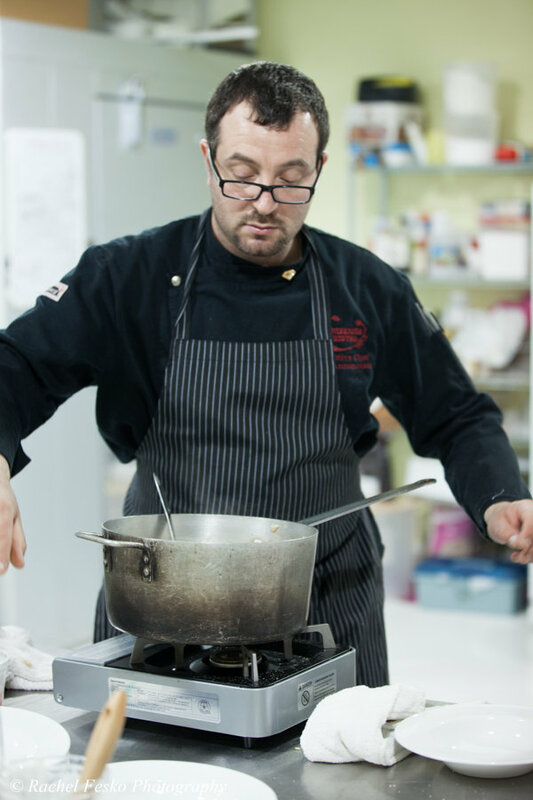 Chef Luca from Passion8 cooked up a storm in WowFactors kitchen. I'm always amazed when chefs can create delicious food outside of their own kitchen comfort zone. WowFactor had a paint by numbers cake that all of us could help paint. It was such a cool idea; each shape had a number that corresponded to an edible paint color. I'm no artiste, but it was fun to contribute and see the finished product! Amy with WowFactors was a huge help in our "blind" eating by telling us which utensil to use. There's me below on the right! I sort of look like I know what I'm doing, right? I will admit to drinking someone elses wine and stabbing myself in the face with a fork a few times. Otherwise I totes handled myself. This was an absolutely amazing experience and is something I may try at my own dinner table one day! Thanks to all the vendors below who helped make such a fun night. Wow! What a unique experience! I love the concept, and everything looks amazing. Do you think you’d recommend something like this to one of your clients? Great concept. Loved the food, decoration. 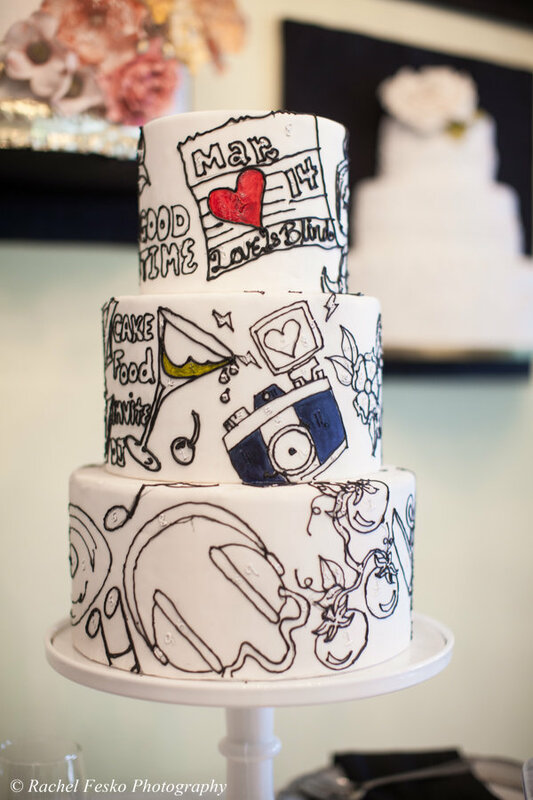 Loved the artwork done on the cake. 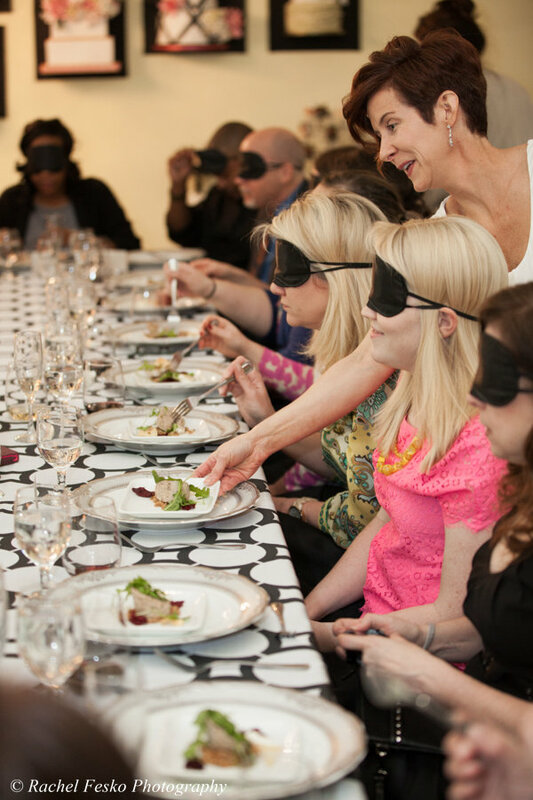 Definitely you might had a great fun to see each & everyone's expression while having blindfolded dinner.